This wide game is based around skills in the Fundamentals that have not been covered in other sessions during today. There are five bases – you have 20 minutes per base. Each base has a number of activities at each base at different levels, so that leaders can extend their knowledge/skills – please do them in the order they appear on the individual instruction sheets. Each activity is worth a certain number of points. Please read the points instructions at each base carefully. Your task is to see how many paper clips you can join into a long chain in two minutes. You have 30 seconds to decide your strategy, including how to keep time. Point score: the number of paper clips in the final chain. If your patrol has an uneven number of people, one person can be the timekeeper. Pass around objects from a cloth bag behind the back. When the last object has returned to its bag, write down as many objects as you can remember. 3. Learn the Een Gonyama chant. Listen to the tape, and learn the Een Gonyama chant. Please rewind the tape when you have finished. In 1887 when Baden-Powell was on military service in South Africa, there were enemy tribes and there were friendly tribes and Baden-Powell had a way of making friends with most of the tribes. But there were certain tribes that couldn't be managed and in order to save the country Baden-Powell called in some of his friends among the friendly tribes, and they promised to come to his assistance. Baden-Powell brought the song home with him and included it in the first Scout handbook, SCOUTING FOR BOYS. But before he did this, he tried it out on British boys during the world's first Boy Scout camp at Brownsea. He taught the boys to sing the Zulu chant and to join him in dance around the fire. But it was more than a dance because from time to time a boy would jump into the circle and while all the others were singing and stomping their staves, the boy in the center would stalk the big hippopotamus or the rhinoceros or the lion and finally kill the wild animal he was stalking. Scouts form up in one line with leader in front, each holding his staff in the right hand, and his left on the next man's shoulder. They then form into a wide circle, into the center of which one steps forward and carries out a war dance, representing how he tracked and fought with one of his enemies. He goes through the whole fight in dumb show, until he finally kills his foe. The Scouts meantime sing the Eengonyama chorus and dance on their own ground. As soon as he finishes the fight, the leader starts the ‘Be Prepared’ chorus, which they repeat three times in honour of the Scout who has just danced. provided the inspiration for the Scout's "war dance". Then they recommence the Eengonyama chorus, and another Scout steps into the ring, and describes in dumb show how he stalked and lolled a wild buffalo. While he does the creeping up and stalking of the animal, the Scouts all crouch and sing their chorus very softly, and as he gets close to the beast, they simultaneously spring up and dance and shout the chorus loudly. When he has slain the beast, the leader again gives the "Be Prepared" chorus in his honor, which is repeated three times, the Scouts banging their staffs on the ground at the same time as they stamp "Bom! bom!" At the end of the third repetition, "Bom! bom!" is given twice. 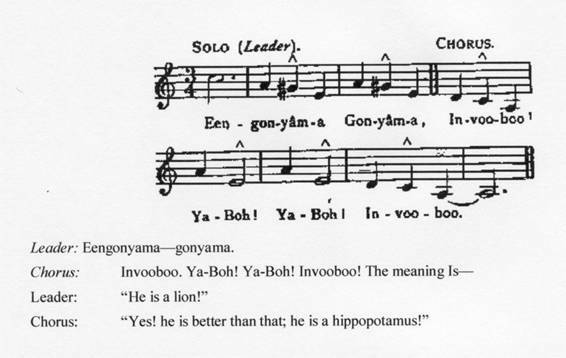 The circle then closes together, the Scouts turn to their left again, grasping shoulders with the left hand, and move off, singing the Eengonyama chorus, or, if it not desired to move away, they break up after the final "Bom! bom!" Although the war dance and songs may seem at first sight to be gibberish—especially to those who have never had much to do with boys—yet there is a certain value underlying them as a corrective of self-consciousness. From Scouting for Boys, Yarn 4. Pick one type of ceremony from those below, and create a ceremony for it. Write the ceremony up on butcher’s paper. Present it at the end of the wide game. Please tick off the ceremony you have done, so that the patrols after you don’t do the same one. Point score: Out of 10. Score to be determined by other patrols at presentation. Build and light a fire with no more than two matches. Choose from A fire, pyramid fire, council fire (in miniature). 10 points to start. Lose 2 points for every match you use to light the fire. Start with 10 points. Take one point off every time a card has to be moved to the correct place. 10 points if you get back to the correct spot. Extra 10 points if you work out a 5 legged walk and do it correctly. Lay out the white question pages. Find the correct answers (green slips of paper) for each page, and put them in the appropriate boxes. Check your answers with those on the pink pages when you have finished. NOTE: There are some wrong answers!! This game comes from http://www.ssrguides.org/resources.php?sub=firegames. There are five sets of compass points, all mixed up. Each set is a different colour. Each person is to box the compass* with one colour. First person to finish correctly wins. Each person’s compass is checked by someone else, and points are taken off for incorrect placings. Time yourselves to see how fast the patrol can collectively box five compasses in the correct colours. * Boxing the compass means to put all 32 points in the correct order, in a circle. This game used 16 points only. The 32 point compass would be more challenging, and perhaps more suited to Senior Guides. Pre-Junior Guides and Junior Guides would probably only cope with four and eight points respectively. Reciting this list is known as boxing the compass. It was considered to be one of the basic skills of an apprentice sailor to be able to recite these directions. 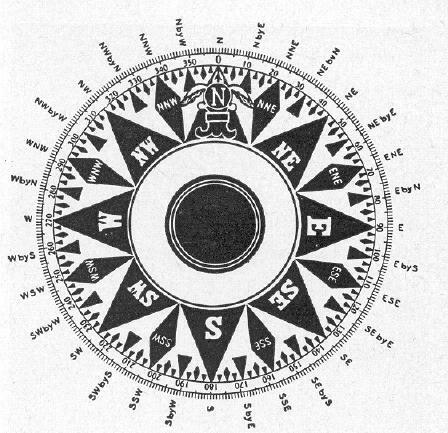 The point between North and NNE was N by E.
The point between NNE and Northeast was NE by N.
The point between Northeast and ENE was NE by E.
The point between ENE and E was E by N.
This followed in like fashion around the compass. The above section, including the image, comes from http://www.mcallen.lib.tx.us/staff/compcrd.htm, and is used here with permission. Walk 8 Paces heading 62 degrees. Walk 8 Paces heading 182 degrees. Walk 8 Paces heading 302 degrees. Walk 10 Paces heading 104 degrees. Walk 10 Paces heading 224 degrees. Walk 10 Paces heading 344 degrees. Walk 9 Paces heading 116 degrees. Walk 9 Paces heading 236 degrees. Walk 9 Paces heading 356 degrees. Walk 11 Paces heading 41 degrees. Walk 11 Paces heading 161 degrees. Walk 11 Paces heading 281 degrees. Walk 12 Paces heading 85 degrees. Walk 12 Paces heading 205 degrees. Walk 12 Paces heading 325 degrees. Patrol in a circle. One person is outside the circle with a rope. She goes around the circle, and drops the rope at someone’s feet, and calls for a knot. She must run around the circle to the starting place before the person can tie the knot correctly. If she beats the knotter, they change places. – score one point for every correct knot, and two points for originality. May make one or all items in full size. You are driving along happily one day, when a motorcyclist passes you with a roar on the left. You shake your head as he proceeds to weave from side to side in the lane, as if he is either warming his tyres like they do at the beginning of a big motor race, or, more likely you think, as if he is in a hurry to get somewhere and the traffic is too slow. You suddenly notice that the motorcycle and the car in front of it have slowed down – their brake lights are on. Although you can’t see its indicator (because the motorcyclist is in the way), you realize that the car ahead of the motorcycle is going to turn right into the driveway of a wedding reception place. Then you see the motorcyclist attempt to pass the car – on its right – going directly into its path. You hold your breath, willing him to make it. You see him hit the front right fender of the car, and go careering crazily across the road. Thinking quickly, you look in the rear view mirror, ascertain that there is no one coming up on your inside lane, signal, and pull over to the side of the road. You jump out with your mobile phone, and, when there is a break in the traffic, race across the road to the footpath where the motorcyclist is lying neatly on his back with his feet crossed at the ankles. He is not moving. List all the actions you will take. When you have decided your actions, find the Points to Discuss sheet and answer the questions. When you get to him, the motorcyclist is awake and responding. He says his neck hurts but nothing else does. The car driver is shaking and blaming herself, but is unhurt. She is employed at the wedding reception centre, and has turned up for work for a wedding that is about to start. What do you do for her? The motorcyclist’s mother arrives, distraught. The ambulance is not yet there. What do you do? What do you do when the ambulance arrives? What do you do when the Police arrives? The police asks you for a statement. What do you say? The ambulance calls for a helicopter to take the motorcyclist to a spinal unit. What do you do when it has gone? Check for danger to yourself. Check for danger to onlookers. Check for danger to the motorcyclist (he is off the road and away from traffic). Check for response, airway, breathing, circulation, obvious injuries. Tell him not to move. Immobilise his head. Detail an onlooker to sit with and talk to the motorcyclist while you talk to the driver of the car. Detail an onlooker to obtain a blanket to drape over the motorcyclist. DO NOT MOVE THE MOTORCYCLIST. Reassure him. Tell him where you are going and what you are doing. Tell her that you witnessed the accident, and that she was not to blame. Ask an onlooker to go into the wedding reception centre and get a manager out to be with her. Go back to the motorcyclist, and do a physical check for injuries from head to toe. (You had to see which person needed help most – you did an initial check of the motorcyclist, then of the driver, and now the motorcyclist needs a better examination.) Keep reassuring him. Check that the motorcyclist is still conscious and responsive. Check the motorcyclist’s respiration and pulse rates, and note them down for the ambulance. Note any other unusual signs. Reassure the motorcyclist – hold his hand. Reassure the car driver. Get someone to stay with her. Sit with her, quietly tell her that the ambulance has been called. Ask if there is anyone she wants called. Keep her out of the way when professional help arrives. When the ambulance arrives, tell the paramedics what happened, and what you have observed with both the motorcyclist and the car driver. Do whatever the paramedics ask you to do. When the police arrives, tell them what happened and that you are a witness. Give a statement to the police when requested. 1. Fill in the measurement chart below for each person to take home. NB. If you are using this with your girls, remind them that they are still growing, and will need to update their measurements periodically. 2. Discuss how knowing your own measurements can be of service. 3. As a Patrol, estimate the length of rope you see at this base (without using the tape measure!) Write your estimate on an index card and give it to the activity leader, Make sure you write your Patrol name on the card!